This entry was posted on Monday, December 12th, 2011 at 2:04 pm	and is filed under Art, Development, Media. You can follow any responses to this entry through the RSS 2.0 feed. Both comments and pings are currently closed. This is awesome. No, beyond awesome. Way beyond. Now that is a good quantity that makes a game interesting, especially if they all have different stats and uses (even if just slightly different). For now I’ll be guessing that the big blue Capital ship down in the middle is able to carry a few frigates. Also the ship called “Munitions Ship”, is it like the names implies a stock of ammo on reactors to refill your frontliners ? Is it to be used for general pre/post-battle replenishing or can it be called in fights ? 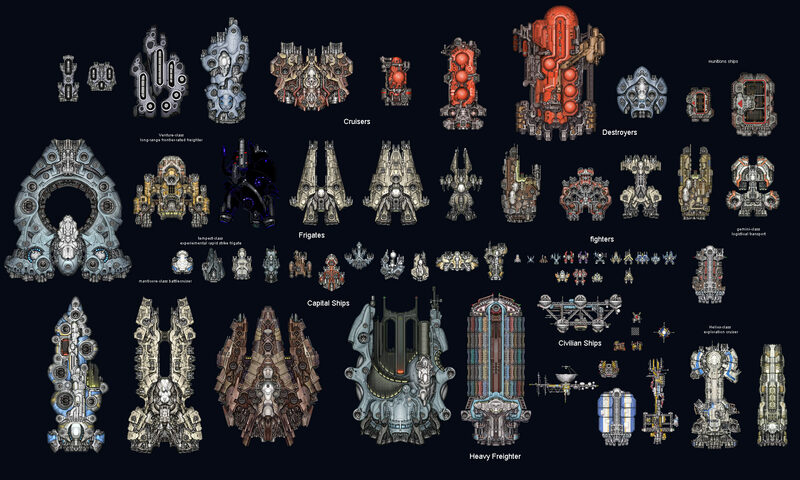 Love those designs BTW, they have a kind of unique feel and give a sense of power, especially those 3 capital ships on the left. @Troll: in theory, it’d be used in fights. Having a hard time seeing it work well, though – it’s more on the “list of things to think about” than “list of things to implement”. By the looks of some those ships, likely they’ll be some pretty …interesting stuff in the campaign? I think the original post didn’t make it clear that this isn’t something specifically made for public consumption – it’s actually a development aid that I think looks neat. does the dark ship…mean theres an anti-matter powered ship ? Those big red hulls on the to, I’ll guess those are tankers. And the blue capital ship I imagined as a frigate carrier, could it otherwise be a mobile repair ship ? Yep, tankers – good guess. The “blue capital ship” is an actual carrier – the biggest one in-game at the moment. Well it wasn’t that hard, they look like what a tanker truck would if you removed the wheels and added a few engines and all basic space ship parts. And the red paint makes it really think of a “watch it, don’t shoot this guy, it goes boom” kind of thing. About what you call “Logistical transport”, is it the kind of mildly armed freighter ship one would use to ferry military equipement, as opposed to a simple freighter which would most likely transport basic comodities ? That one’s a combination freighter/light carrier, with some half-decent weapon mounts to boot. A useful support ship for a smaller task force. Could also make a half-decent flagship in the early-to-mid game for a trade-minded player. I hope when we end up making the future in “real life” it end up looking something like this. Are there any plans for armed stations / forts to be included in Starfarer ? Forgot to add that if we could place those stations, would we be able to choose what goes in the slots. Also about the munitions ships, how about selecting them, have them target an ally ship and have the “resupply” option. The ammo ship would then send out a series of small freight drones each carrying a small quantity of ammunition. Makinf those drones targetable would also add some good strategic proportion, like cutting the supply route on the direct battlefield. @Troll: Star bases and such are on a long-term wishlist, along with a bunch of other combat features. They’re not the highest priority (even on that list), but I’d like to add them at some point. As far as them being customizable, that’s really too far off to say. Good idea as far as munitions ships – since they don’t have a campaign role, they could have a direct in-combat one. The problem with that is ammo just isn’t that big a deal in most cases, so it’d be a lot of bother for nothing. Only very specialized missile destroyer types would benefit. Still, experimenting with that is on that same long-term wishlist – maybe something will come of it. Finally bit the dust, I bought it. – I’m crappy for now, I have heavy trouble getting past a hard mission and no impossible done for now. taht often comes from the faact that I either tend to try to d oit myself and forgetting giving order, or going tactical and forgetting the firepower I hold currently. – For a game that is still an alpha, it’s totally bug free (as far as I have seen) and with load of features while being nicely balanced yet unforgiving for tacticsless gameplay. All said, this game is a good and deep tactical marvel with loads of potential, but my main dissapointment is that I can’t get behinf the helm of the Onslaught anywhere currently. Other than taht, nothing bad to say. We do have a forum, you know Glad you’re enjoying it, thank you for the kind words! I knew about the forums, been there a few times, but I thought (at the at the time of writing that there might be some people coming by the blog to get some info on the game :p.
Fantastic artwork guys. Would you consider putting up a post of a ship design in process? I would love to see the stages the artist goes through in creating these. Keep up the awesome work. Stoked for the future RPG elements. …Derk-a-derr – looks like you already have done this in past posts. Reading = success.